Tropical Smoothie was posted on July 23rd, 2012 and is filed under Dairy Free, Drinks & Smoothies, Kid Friendly, Recipes, Vegan. This entry has 12 comments. You can follow any responses through the RSS 2.0 Comment Feed. I have enjoyed this July Challenge so much – I’ve made a lot of my own smoothie recipes, but I’ve also taken this opportunity to try a lot of smoothies from blogger friends or recipe books. About a week ago, I received this lovely recipe book from my new friend & author Anna Zulaica. 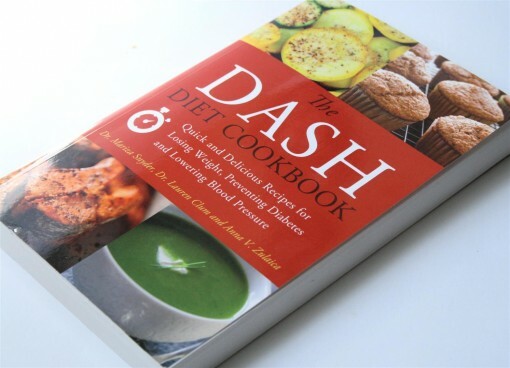 She runs a catering business for healthy food and of course, wrote the cookbook “The Dash Diet Cookbook” (as well as guest blogging at FitApproach). She was so sweet; she even sent a card and signed the book with a note. I thought that a smoothie recipe from this awesome cookbook would be really fun, so I asked Anna if it would be okay to share one of the smoothies. She said yes, so I get to share this delicious tropical smoothie with you. Prepare to be whisked away to the Bahamas! Serves 2. Place all the ingredients in the blender. Start blending on low, and as the contents begin to break down, increase to medium speed until completely smooth, about 1 minute. Serve immediately. It is seriously delicious and oh-so refreshing. Now I’m super excited to try out the other recipes in Anna’s Dash cookbook. Just flipping through it made me really happy! One of the things I most loved about the book was that she included ALL the nutritional info for each recipe, which is really important to me. Sometimes I track my protein, sugars, fiber, and/or calories so this is a fantastic feature. The book’s basis features recipes that help people lose weight, prevent diabetes, and lower blood pressure. Every recipe I looked at sounded divine (so excited to try her Protein Bowl recipe!) and all the ingredients are very healthy. Other recipes that caught my eye were the Veggie Frittata with Caramelized Onions and her Mexican Summer Salad. I also love how simple each recipe is to make. Big shout out to the amazing Anna, so check out her book! Oh, and did you notice the straw in the picture? It’s a glass straw from Strawesome – for years I have been wanting to try a reusable glass straw instead of the cheap, plastic straws (you just throw away in the end!) so I love this! If you’re a Colourful Smoothie challenge participant, you might have a chance to win one! Also, they’re so pretty…and drinking smoothies is so much more fun with a straw (because I’m 5 like that)! Oh, and I also wanted to mention that we have our weekly winner for the Vega Energizing Smoothie! It’s Angela from the Chicken Scoop! Thanks for participating! Hope you had an awesome weekend – I know I did! We were gone singing all weekend and that’s always awesome. What is your favourite tropical fruit? 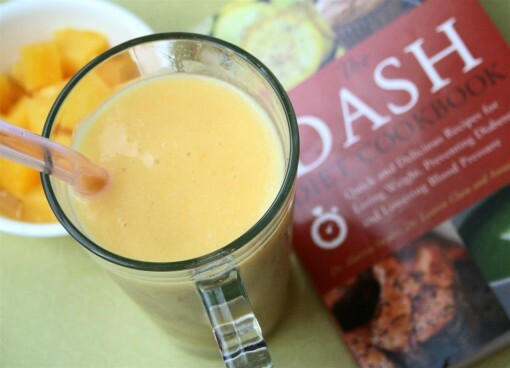 Have you heard of using glass straws or Anna’s Dash cookbook? I am always obsessed with finding new cookbooks! It’s a bit of a problem ;) That smoothie looks delicious as always! Pretty smoothie pictures:) Sounds delicious, too! 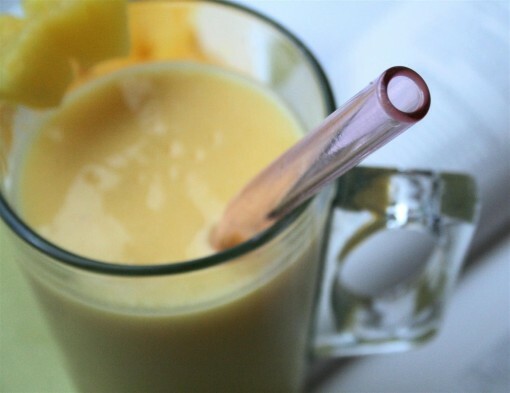 I am obsessed with my reusable straws – I swear they make my smoothies that much more delicious! Oooh how cool!!! I’ve been wanting to try the Vega mixes!! Just let me know what you need me to do. Send you an email? On a side note, I use stainless steel straws. The only downside to mine is that they have a bend in them (hard to clean) and you can’t see through them (is it clean?) but its better than throwing something out every day! That smoothie looks delicious. Love all the tropical fruits in it and the cute straw (I’m 5 like that sometimes, too). Yum! Great minds think alike. I also just posted a recipe for my Thick Green Tropical Smoothie. I can’t resist anything that has the work ‘tropical’ in it. I have always wanted to try glass straws too. I used to love drinking my smoothies through a straw. I’m not sure if my green thickies are too thick for a straw though, hmmmm…. I love the idea of using coconut milk in a smoothie. Katherine~ They have different types of straws, I choose the bigger “Smoothie” style straw designed just for the purpose! Yum! This looks like it will be my favourite smoothie I try for this year’s colorfulsmoothiechallenge! Mango is my favourite, and coconut milk too. And those straws sound awesome too. 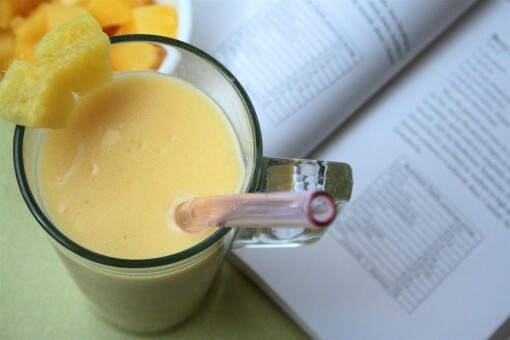 Have to say that tropical smoothies are always a favorite! !